Our fully integrated Takmats covers up to 92 % of your exposed carpets, using a combination of our padded Taktech grey fabric and a 3mm rubber mat. The Takmats are easy to remove for cleaning purposes and easy to re-install. Backed by our life-time guarantee you know you will be covered. This program is only available for the Cantech and Signature Range seat covers. 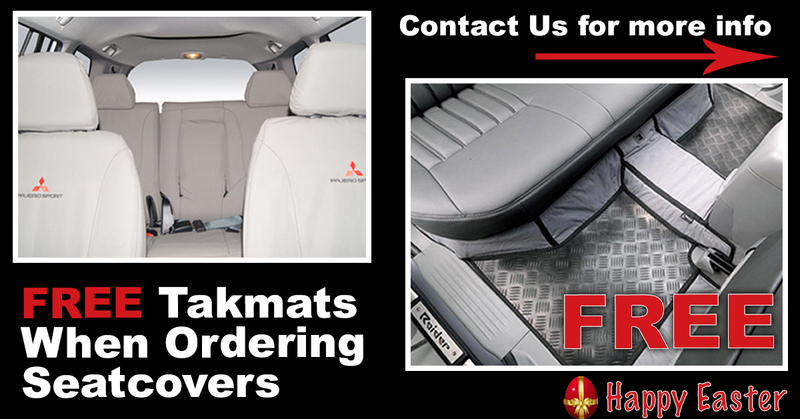 FREE Takmats are only eligible in Grey Taktech, any other colours or fabrics will be quoted separately. All orders/payments need to be in prior to the 19th April 2019, no order/payments after will be considered. This program is valid through our dealer network. Takla Products reserves the right to withdraw this program at any point without notice.